"I purchased Science Pilot at the end of the year last year and have been using it since Day 1 this year. I love the content maps to introduce the skills. The maps go great in their science notebooks. The hands-on activities are fabulous because I can tell very quickly if a student understands the concept or not. Probably my favorite part is the ten question assessment. Ten questions are enough for me to tell if the students really understand the concept and it doesn't take very long for them to complete the assessment. It is a quick, easy tool to determine the level of student understanding and what I need to go back and reteach." 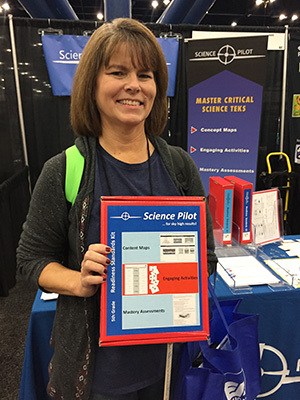 "We use the Science Pilot kit and I absolutely love the content maps. I set up stations in my class. The students worked through the content maps first, then performed the engaging activity, and finally answered the assessment questions at the last station. I even added extra hands-on activities. The students loved it and did very well. I then put all the content maps together and let the students take them home as a review to prepare for STAAR." "We used Science Pilot last year as a teaching tool and STAAR review. We had the highest STAAR scores we have had in the last six years." "I have used Science Pilot for my 8th grade science class for almost two years. I love it! It truly hits the nail on the head! The TEKS activities are engaging and I especially appreciate the 10 question quizzes. I use this to wrap up my units and I can truly tell which students are on track with me. The questions are well thought out and mirror STAAR-type questions. This is probably the best purchase I made last year to help me practice STAAR-type questions with my students. Thank you Science Pilot!" "My 5th grade science teacher loves your product. She uses it during Advisory and in her 5th grade class when students don't understand a concept. It is a fantastic product and we love it!" "We used the Science Pilot 5th Grade kit last spring for our STAAR review. We took bits and pieces from the kit, added some of our own material, and some district material to make our science review. We were very successful with our STAAR scores." "We like to use the Science Pilot kit as 'bell ringers.' We also use the questions to create our Content Based Assessments which are given to students every six weeks. The questions are thorough and cover the content that was taught."